Pioneer Park, site of the first Hall County Courthouse, honors the courageous settlers who peacefully inhabited this area in 1857 when only Pawnee lived here. In 1866 the Union Pacific reached Grand Island and in 1868 the railroad donated Block 19 for the construction of county buildings. Three years later the county commissioners requested that General Grenville M. Dodge, agent and trustee of the railroad, exchange the property for Block 84 where this park is located. Special elections were held in 1872 wherein bonds totalling $20,000 were issued for construction. A two story courthouse with a clock tower was completed June 28, 1873 at a cost of $16,500. In 1901 a special election voted bonds for a new courthouse and other county buildings. When the new structure was completed in 1905, the original courthouse was razed. Four elections were held from 1902 to 1905 to authorize the sale of this block, but dedicated work by the Women's Park Association maintained this site as a memorial to Hall County pioneers. In 1964 action was brought to construct a new postoffice on this land and a 1970 election was held to locate a new library here, but the park was preserved on both occasions. 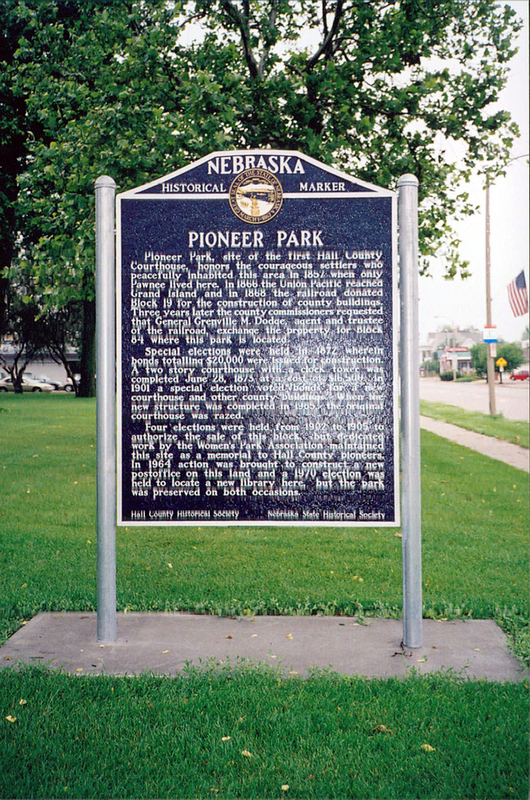 “Pioneer Park,” Explore Nebraska History, accessed April 18, 2019, https://mynehistory.com/items/show/248.